The British Airways Concorde, G-BOAB was on a scheduled transatlantic passenger flight from London to New York. After the aircraft had been airborne for 1 hour and 57 minutes, when cruising at FL 530 and Mach 2, the crew noticed a momentary vibration which, in the absence of any unusual indications on the flight deck instruments, they assumed to be caused by a brief engine surge. However, approximately one hour later, as the aircraft was descending and decelerating below Mach 1.4, there was a sudden onset of severe vibration that was felt throughout the aircraft. Although the crew were unaware of the source of the vibration, portions of the upper rudder were probably separating from the aircraft at this time. In attempting to diagnose the problem it was found that increasing power on No 2 engine appeared to cause the vibration level to increase and accordingly, as a precaution, this engine was shut down. Aircraft handling was apparently unaffected until during the manual landing when more than normal right rudder was needed. However, an otherwise uneventful 3-engine approach and landing was carried out at JF Kennedy International Airport, New York. Upon landing, the crew were informed that a large section of the upper rudder was missing. 1) The bonded honeycomb structure of the upper rudder, upper wedge broke-up as a result of delamination of the skid/honeycomb bond. 2) The reason for the presence of the delamination could not be established with certainty but the balance of evidence pointed to weakening of the skin/honeycomb bond, brought about by the accidental ingress of preparation materials into the core during the course of a major repair performed some 254 flying hours before the event. 3) The large size of the repair to VW23 would have made successful application of the repair procedures all the more challenging and sealing of the original structure to prevent the ingress of preparation fluids more difficult. 4) The potential for repair preparation materials to adversely affect the skidhoneycomb bond strength was not generally appreciated before this accident. 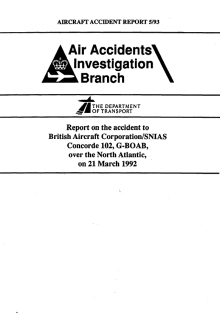 They revise the content of Airworthiness Directive 022-04-89 and associated British Aerospace Alert Service Bulletin 55-A-007 to decrease the inspection intervals to prevent the possibility of further failures of Concorde rudder bonded structures. Particular attention should be drawn to rudders with existing repairs which should be re-inspected within a very short time. They investigate, in conjunction with the operators and manufacturers, improved NDT inspection methods for Concorde honeycomb bonded structures. In particular, devices which seek to replace the manual \'tapping\' method by electronic instruments appear promising and should be given serious consideration. They re-examine with the manufacturers and the operators the approval and quality control procedures for large repairs and with the manufacturer the relevant chapters of the Structural Repair Manual. Distance from London-Heathrow Airport to New York-John F. Kennedy International Airport, NY as the crow flies is 5499 km (3437 miles).